Baguette Width 950 Platinum. This Ring is Also Available in Diamond Clarity SI, VS & VVS with 9K, 18K White, Yellow, Rose Gold & 950 Platinum. Diamond Colour This ring is also available in following sizes H, H½, I, I½, J, J½, K, K½, L, L½, M, M½, N, N½, O, O½ and P.
Diamond and 18ct White Gold Ring. 18ct White Gold. 1.00ct Brilliant and Baguette Cut. Round Brilliant and Baguette Cut. baguette cut diamonds , weighing a total of. very good VS2 clarity , so they are particularly transparent diamonds - totally clean to the naked eye. 2.00 Ct Baguette Diamond Full Eternity Ring. Diamond Shape : Baguette Setting Type : Channel Setting. 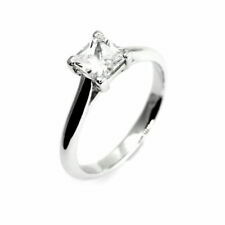 Diamond Carat : 2.00 Carat Ring Size : I,M,N,P. 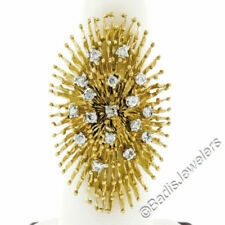 -This ring is also available in Platinum, 18K White, Yellow and Rose Gold. 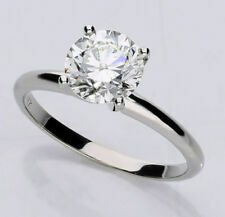 Main Stone Shape : Baguette Secondary Stone Shape : Round Brilliant. Main stone : Diamond Style : Full Eternity. Diamond Education. Diamonds color : F Cut : Very Good. The Internet changed all that. 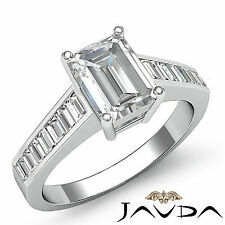 Occasion : Anniversary Total carat weight : 2.50 Carat. 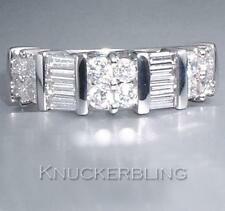 2.25 Ct Baguette Diamond Full Eternity Ring. Diamond Shape : Baguette Setting Type : Channel Setting. Diamond Carat : 2.25 Carat Ring Size : N. -This ring is also available in Platinum, 18K White, Yellow and Rose Gold. Claridad : VS1 - VS2. Certificado por GIA USA. Claridad VS2 y Color F. Forma : baguette. Clarity VS2. Anillo de compromiso. Tamaños de anillo disponible de 4 a 7. Tipo de piedra : Diamante 100% Natural. All our products are available in White, Yellow, Rose gold and Platinum. We can customize our products including the center diamond shape and specifications according to your preferrence. Please contact us for your preferrence and one of our representative would be more than happy to help. 1.89 ct VS2 D princesa corte diamante anillo de compromiso billones de Baguette lado 18 k. ¡Este anillo de compromiso ha sido diseñado con un detalle especial! Total quilates peso 1.89. Clarity VS2. Anillos de compromiso de diamante de Corte Princesa. Baguette & Round Diamond Full Eternity Ring. Diamond Shape : Baguette & Round Brilliant Setting Type : Channel & Micro Pave. Hallmarked By Assay Office London. Diamond Cut : Excellent Hallmarked By : Assay Office London. F/VS 2.75 Ct Baguette Diamond Half Eternity Ring. Diamond Shape : Baguette Setting Type : Channel Setting. 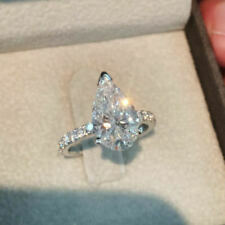 Diamond Carat : 2.75 Carat Ring Size : M. -This ring is also available in Platinum, 18K White, Yellow and Rose Gold. Todos nuestros productos están disponibles en blanco, amarillo, de oro rosa y platino. Podemos personalizar nuestros productos, incluyendo la forma del diamante centro y especificaciones según su preferrence. Por favor, contacte con nosotros para su preferrence y uno de nuestros representantes sería más que feliz de ayudar. 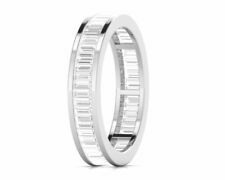 Tiffany & Co Platinum redondo anillo de compromiso de Baguette. Centro diamante pesa 0.69 ct(Certificado de Tiffany). Clarity VS2. Certification/Grading: Tiffany & Co. Peso en quilates diamante total del anillo es 0,92 ct.
And 18ct White Gold Cluster Ring. These diamonds are of approximate colourless. 18ct White Gold. The ring is currently a. 0.80ct Brilliant & Baguette Cut Diamond. Brilliant Cut & Baguette Cut. tapered baguette cut diamonds . Con veintiocho.01 G VS2 redondodiamantes y 10.06 diamantes baguette de VS2 G peso quilate total de.88 quilates. Pesa 3.8 gramos. Clarity VS2. Mi objetivo es ofrecer excelente calidad a excelentes precios. And 18ct White Gold Ring. These diamonds are of approximate colourless. 18ct White Gold. The ring is currently. baguette and brilliant-cut diamonds , weighing an total of. very good VS2 clarity , so they are particularly transparent diamonds - totally clean to the naked eye. (Luego está flanqueado a ambos lados por una baguette afilada corte añade un toque tan rico a este magnífico anillo de diamantes. Esta declaración es muy bien vale la pena la inversión. Disfrute :). (2) natural genuino diamantes - afilado corte Baguette - barra Set - E/F Color - VS1 claridad - 1.10 ctw (aprox.). Clarity VS2. Toda nuestra joyería esoro sólido. Nosotros no vendemos llenos, joyería hueco o plateado. 18 quilates de oro blanco sólido. Tamaño del anillo Los hombres anillos de diamante. Tamaño del anillo no afecta a la política de devolución, siempre que hace para nosotros. 100% diamantes naturales Hecho en EE. UU. ENVÍO GRATIS 30 días Regreso GIA 2.90 Ct Anillo de compromiso de diamante de talla esmeralda con Baguette G, VS1 14k ESPECIFICACIONES DE ANILLO en blanco Total de Ct. Peso: 2.90 CT. Metal: oro blanco de 14 k Tamaño del anillo: Valor $ 45,550 2.30 Color del quilate: G Claridad: VS1 Piedras laterales Tipo de diamante: Corte de baguette natural Peso: 0.60 Connecticut. Color: G Claridad: VS1 Actualizaciones disponibles: 14k W / Y / Rose Gold18K W / Y / Rose GoldPlatinum Free 265.00 995.00 ¿Quieres personalizar un artículo? Nuestros especialistas en diseño pueden ayudar.​ ​ ​ ​ ​ ​ ​ Este anillo de compromiso de diamante fino ofrece una GIA certificado centro diamante. -100% diamantes naturales de origen ético. Clarity VS2. Toda nuestra joyería esoro sólido. Nosotros no vendemos llenos, joyería hueco o plateado. Tamaño del anillo 18 quilates de oro rosa macizo. Los hombres anillos de diamante. Tamaño del anillo no afecta a la política de devolución, siempre que hace para nosotros. Clarity VS2. Toda nuestra joyería esoro sólido. Nosotros no vendemos llenos, joyería hueco o plateado. Main Stone Shape Baguette. 18 quilates de oro blanco sólido. Tamaño del anillo Los hombres anillos de diamante. The ring is a finger size L and is stamped 18ct inside the band. This ring weighs 7.5 grams and is in excellent used condition. It is not always possible for a ring to be resized. You are viewing a second hand stunning baguette diamond half eternity ring. Set with 7 x 3mm x 2mm baguette diamonds. Rub over style, ie no claws. Total diamond weight is approx 0.70ct. The gram weight of the ring is 5.5g. 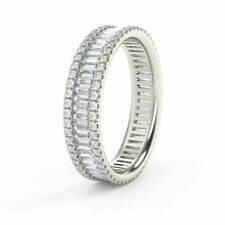 Baguette diamond full Eternity Ring. Diamond Shape : Baguette. Diamond Shape :Baguette. This ring is also available in Platinum, 18K White, Yellow and Rose Gold. 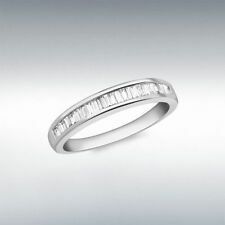 Ring Size : J, K, L, M, N, O, P.
1.80ct Baguette diamond full Eternity Ring. Diamond Shape : Baguette Cut. This ring is also available in Platinum, 18K White, Yellow and Rose Gold. DIAMOND JEWELLERY. Diamond Cut : Very Good. Diamond Color : F.
Baguette and Round Diamond Full Eternity Ring in Platinum. Diamond Shape : Round Brilliant and Baguette. Hatton Garden Jewellery Quarter, London. This ring is also available in Platinum, 18K White, Yellow and Rose Gold. I1-I2 :- Inclusions visible to the naked eye yet lots of life and sparkle. Great value and still stunning. I3 :- More heavily included and easily visible with the eye often milky stone with little sparkle. This beautiful ring showcases a gorgeous 0.35ct brilliant cut diamond rub over set in 18ct white gold. Either side of the central diamond are matching 0.15ct baguette cut diamonds. 18ct Yellow Gold 0.55ct Diamond Baguette Half Eternity Ring Size J 1/2 4g Weight- 4g Size- J 1/2 Feature length- 4.5mm Feature width- 18mm 18ct Yellow Gold Clarity- VS2 Colour- E Total Carat Weight- 0.55ct Baguette Diamonds and Round Brilliant set on shoulders Quality Half Eternity Ring Used but in good condition, Item has been thoroughly cleaned and polished by our professional in house jeweller. Upon purchase item will come packaged in a luxury Richard Miles gift box. If any questions arise feel free to message us!. The item for sale is a stunning 18ct gold half hoop eternity band ring. fully hallmarked 18ct gold 2004. 15 oblong baguette cut diamonds. within a white half hoop pave setting. RING SIZING AVAILABLE. Ring sizing facility. 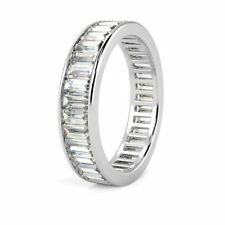 $Brand new direct from the manufacturer 18ct white gold channel set baguette diamond eternity ring. Hand set and finished to the highest of standards in our Hatton garden workshop by master craftsmen. ideal gift for any occasion or even a treat for yourself. Comes complete with luxury presentation gift box.